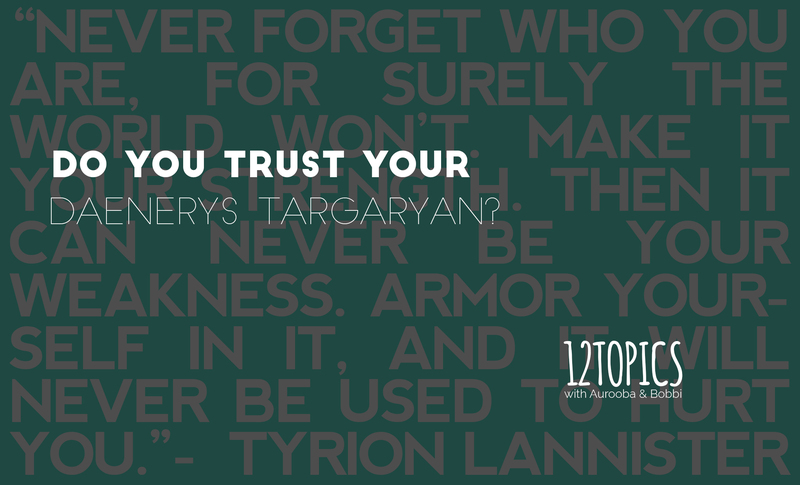 do you trust your Daenerys Targaryan? Sometimes I think I’m funny. I promise, you’ll understand the title shortly. In 2015, Aurooba and I are collaborating on a blogging project called 12 Topics. On the second Tuesday of every month, we’ll be writing a post about the same topic from our own perspectives + experiences. Basically, the topics are writing prompts/questions that we’ve come up with ahead of time. We also went ahead a gave each prompt a more general category. On the fourth Tuesday of every month, our 12 Topics posts will be inspired by that category. There are so about a million different types of relationships. Okay, that might be an exaggeration, but there are so many. Best friend. Parent. Sibling. Partner. Coworker. Service provider. Boss. Landlord. Side thought: really, we still call the people we pay rent to our landlord? That’s one term I definitely use without thinking how old it is. I never put two and two together until now. Now all I’ll be able to think about is Game of Thrones. Or something (yes, I know Game of Thrones is not actually history). They never explicitly say landlord, I don’t think, but still. I will now forever be picturing Daenerys Targaryan every time I pay rent (because actually I have a landlady). Ok back on track. There are a lot of types of relationships types out there, and the one trait I thought of that applied to every single one of them was trust. Trust is a huge deal. Huge. I couldn’t think of a better way to prove it to you than to go through every single relationship type I listed above. As you go through the list, imagine being in a relationship that didn’t have each of these things. Would you consider it to be a successful relationship? This is pretty much a mix between the trust between best friends and the trust between parents and children, so I won’t repeat those point. And I won’t even get into the amount of trust required if you have kids. Okay seriously, you get the idea. I believe I’ve done my job of showing you a bunch of ways trust is important for any relationship, and then some. And in doing so, I’ve written ‘trust that they’ far too many times for my own liking. Maybe it’s that trust is a sign of a good relationship. It’s not really that trust makes a relationship better (because it’s pretty difficult to decide to just trust someone out of nowhere – it’s one of those side-effect feelings), it’s that trust just happens in a good relationship. So trust isn’t something you can do to make your relationship better. In fact, trusting someone in your life who shouldn’t be trusted will probably end up hurting you even more. So my advice, if your relationship isn’t going well for some reason, would not be to blindly start trusting someone. Trust comes from past experiences. So if you’re in to evaluating your relationships (for some reason or another), consider if you trust the other person. Did you ever do the trust fall game with anyone growing up? You know, the one where you close your eyes and fall backwards, trusting the person standing behind you to catch you before you hit the ground? I went with trust because I was thinking about something fundamental to all relationships. Something that could be applied to anything and, without it, the relationship would not be considered successful. I’ve since realized, in conversations with a few people, that a lot of traits are fundamental to a successful relationship. Communication, for one, is one of those things. What I did notice, however, is that most of the other traits are controllable. You can learn to communicate more. You can work at being honest. But what you cannot and should not do is blindly trust, or force yourself to trust against your gut feeling. I think this places trust on a different level than other traits.